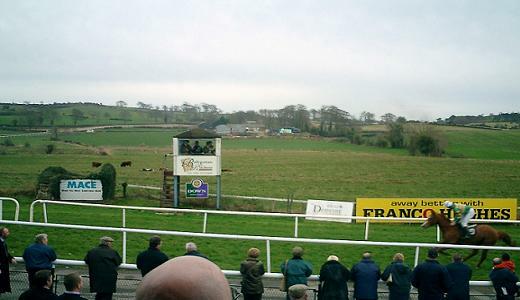 It was my company’s sponsorship at Downpatrick racecourse that took me to Northern Ireland on 19 November. An early flight was met by a Downpatrick member at Belfast City airport, who kindly chauffeured us to the track. As we had time to spare we detoured to see Down Cathedral under which Saint Patrick was allegedly buried in the Fifth Century. The cathedral in various guises dates from this period, although the present building opened in 1818. The racecourse is only a thirty minute drive from the airport. In many ways it’s a typical country track – sheep grazing in the shadow of the winning post and a mountain range on the horizon. They say if you can see the mountains it’s about to rain. And if you can’t see them it is raining! It’s the most undulating track I’ve ever seen. Eat your hearts out Epsom and Brighton. The narrow straight didn’t look much wider than Crayford. Four-in-a-line at the winning post just couldn’t happen. Fortunately the stiff uphill finish sorts them out before the run in! The winners’ prize money was 50,000 euro, spread over the seven races, more than any other UK track racing that day – including Kempton. Despite the decent prize money, racing at Northern Ireland’s two venues – Down Royal and Downpatrick – is lagging behind developments elsewhere in Europe.There are no tote facilities at either track (except Down Royal’s festival meeting). A tote service used to be provided during the 60s by Tote Ireland staff traveling up from the south. Once the troubles started the service discontinued and has not been reinstated. There is no Sunday racing and no Sunday opening of the province’s betting shops. 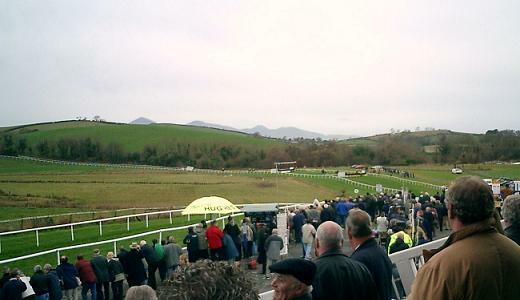 A consultation process on the draft Betting and Gaming (NI) Order 2003, which would allow Sunday racing with betting on-course at both tracks, concludes in December. However, there is no proposal to allow betting shops to open on a Sunday within this draft. If Westminster is to govern the province then implementation of the Order would be anticipated by next summer. If the Assembly is up and running again, then timescales would depend on who gets the Social Development brief, under which betting and gaming have fallen in the past. Clearly the two tracks are at a disadvantage. The economic and social benefits of Sunday racing and on-course betting are obvious, because of success elsewhere in Europe. Off-course Sunday betting looks a long way off. Downpatrick – which has staged racing in the area since 1685 – offered a superb day’s entertainment. Seven races with a total of 87 runners. It was only £8 entrance to all areas of the course or alternatively £32 for a package which included admission, racecard and three-course lunch in the marquee. The food was excellent. Later in the marquee an adjacent table to us were doing their party pieces – taking it in turns to sing solo. A pleasant enough background to proceedings. Then instead of breaking into song one of the party treated us to the commentary on Red Rum’s 1977 Grand National – even switching between Peter O’Sullevan and Michael O’Hehir voices at the appropriate times! When Red Rum crossed the winning line sustained applause was heard from all the diners. Without tote facilities there was no betting focus for me, so the highlights of my day were awarding trophies to three of the race winners. The first was to connections of 1,000 euro bargain Lorenzetti that won the opener – a maiden hurdle. The owners were from Ballinrobe and were surprised to learn that I had been racing there in July. I was immediately offered free accommodation at their pub! When Live Our Dreams in the Istabraq colours stayed on well to win the Beginners’ Chase at 10/1, I thought I might be presenting to the great JP. But of course he wasn’t there. It would have been more like 10/11 the winner than 10/1 had he been! This was first time out for Live Our Dreams over fences and I reckon he could be worth following over the larger obstacles. I presented the trophy to Niall Madden, the trainer. If you’re as old as I am you’ll remember him as jockey “Boots” Madden. My final trophy presentation was to John Corr the well-known owner of Moscow Express. His Deep Return had obliged in the Bumper – first time out for Noel Meade. Boots’ son Mr. NP Madden (5) rode the winner. Deep Return will be seen over hurdles shortly. As we were driven back to the airport, the mountains disappeared from view. It didn’t put a dampener on a great day, but yes, it had started to rain.